This is a techniques which I have never used before. I love fitted skirts, but have always just made A-line or half circle shirts to avoid having to make alterations for my severe hip to waist ratio (110.5 hip, 73.5 waist). 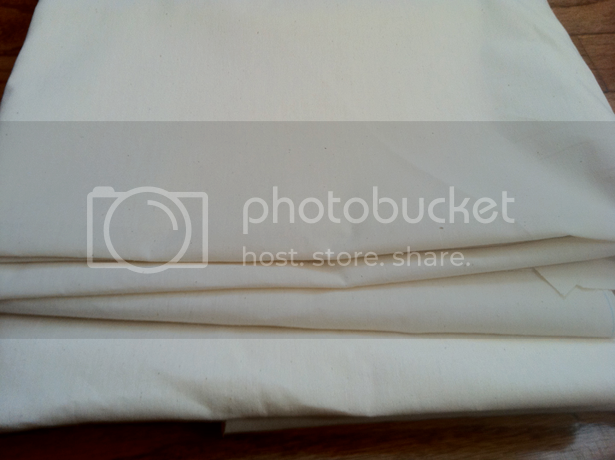 I have now been researching how to make a sloper/muslin/toile in my personal measurements. I haven’t had any luck yet in getting the right looking shape of pattern. Everyone seems to give different directions on, “How to properly measure.” I haven’t given up, though. Hopefully soon I’ll get it right. I know this will help fitting my, rather, robust backside. I’m currently studying for my diploma in dress making and this article has helped me with visualizing what I am trying to achieve with making a toile. I just wanted to thank you. I never make toiles (anymore), as I don’t have the time and courage to make one. I know the problems of my body when it comes to fitting, and know what adjustments to make on the pattern (more or less). Maybe I will make a toile when I use verry expensive fabric or for making something special. Thanks for the extra info. Yesterday I was working on my very first pattern. Previously I had made garments (for my daughter) using actual measurements instead of a pattern. And I had found one that I had to make. When I looked at the measuements, I found I had a perfect bust and hip for the medium pattern (on a single size pattern), but my waist measurement was 4.5 inches bigger than the pattern. After searching the internet for tips (and emailing the pattern designer), I added 1.2 inches to each waist measurement of the bodice, then made up a toile and found that my adjustments were perfect. For the skirt, as I wanted it flowy, I just removed 4 of the 6 darts (the two in the back and the two closest to the side seam). I don’t know if it was the right way, but I got the finish that I wanted. I just need to go out and buy my nice fabric. I had never used a pattern before and found making the toile a great experience. Well worth the time. Now I know that I can make up this pattern and get the fit I want. But the problem comes when I want to tailor the dress as it should be, I will have to edit the pattern to include the darts. And also, Big 4 are NOT consistent even in the same “line”. Fuzzyg is right about that as well. I think that fuzzy does have a point about the growing popularity of muslin making for people who are sewing normal everyday clothes only for themselves, not specialist stuff like wedding dresses on commission, etc. The fact is that a pattern company traditionally has a “fit model” – usually a size 40 – on which all their sizes are based. As well as the standard bust, waist, hip measurements, the fit model has a shoulder width and slope, leg length, waist length etc. And it is consistent in every pattern. The reason I LOVE burdastyle magazine WITH A PASSION (sorry for shouting, but it’s the real thing!) is that they give you the ENTIRE SET OF MEASUREMENTS (biceps, neck circumference, you name it, it’s there) and they are consistent in their drafting. I always without fail need to subtract 5cm from the arm length – in fact I never need to measure the flat patterns really. It’s always the same. Burdastyle shoulders always fit me. I always need a swayback adjustment, but it is always exactly the same. So it’s quick and easy to do on the paper pattern I trace without needing to make a muslin. With the Big 4, they do not give any measurements except the basic three. You have to measure and calculate everything and muslin if you don’t want cuffs too short/too long, shoulder seams round your elbows or halfway to your neck, etc, etc., bodice too long/short etc, etc. And to make matters worse the large companies have “different lines” (Sandra Betzina, Khalia Ali, etc) and they don’t give the measurements for the different lines, so you have to muslin all over again if you want to try a different line. This is why people muslin so much now and why we didn’t used to. Ironically, we more “choice” but less information about what we are choosing. It is really irritating! So now, if I see a pattern from the Big 4 that I like, I just wait a few months ( or weeks) until Burdastyle Magazine brings out something very similar! Kudos to Burdastyle magazine! Class! And thank you, because since I found you two years ago, you have improved my sewing life enormously. Thank you Marina for answering mine and so many other’s questions with detail and thoughtfulness. Great idea on camera and tripod for lots of reasons – now I also know how to take my Burda Club photos and start up loading as well! This is such a super community of learning. All you do is sew up a few side seams maybe a shoulder seam…and try it on your body. From reading so many of the posts it seems some people actually make the entire garment from start to finish and then make it again in their fashion fabric. So, that’s my “two cents” on the muslin making. I personally make muslins because I have a huge bust and smaller waist and hips. According the the pattern directions I usually need a size 22 bust and a size 14 on the bottom. I also have to add about 3 inches of length in the bodice as well. I don’t wear a 22 across my back, shoulders or neckline….so it is just an absolute mess of trial and error to actually get something to fit me…even when I make it myself! Actually it sounds like you could benefit from some focused FBA help :-). There’s Debbie Cook’s series of tutorials http://stitchesandseams.blogspot.com/2001/02/tutorials.html which I find excellent, very clearly explained. And for the advanced version, there’s the Full Busted? video by Palmer and Pletsch (and Alto) which covers more styles and more varied situations. Once you know exactly how much you should be adding for yourself, and have an idea of how to proceed, you’ll get much more hits right off.. Courage! It can be done. every time I do not test the pattern, i waste the fabric. this is due to the fact that i have a short, full body type. The patterns rarely fit the way they are expected to. Usually , the first problem I encounter is in the necklines. Somehow they always are cut too wide, which cannot be fixed once the fabric is cut. That requires pinching in at the center back lines, and removing fabric from the front as well. Whenever i find myself feeling lazy, it usually ends up being a sewing re-do. Another point… Even if the cut is salvageable in your lovely fabric, having to alter the item often WILTS the finished garment. it is so much worth the extra hour or two to cut and sew a simple test. I use old bedsheets to make my muslins. It’s got a nice weave, straight grain and I can toss them once I transfer the changes to the patterns. I tend to have to do fittings due to short back and rounded shoulders. My love for princess seams really does require a number of alterations. But then I can make as many as I like! When I did my one semester of sewing classes at my university we first learned the importance of toile, and I was glad for it because I was completely new to garment construction and the toile saved me a lot of headache in running back and forth to replace my fashion fabric. I bought a few yards of cheap plain brown cotton and I still have my a-line and flare skirt toiles that I reuse when I want to make new skirts. That being said, I don’t think toile is necessary all the time… because really and truly it doubles your work load. Only if I am definitely unsure about a pattern will I pull out my brown cotton otherwise I find it easier and more convenient to just pin test my garment (pinned alterations before any cutting or sewing is done). Has anyone tried Nancy Zieman’s Pivot and Slide Technique for fitting a pattern. I find it works very well. However I am old, out of shape, have a long waist and SHORT legs and often need to make additional changes on the pattern pieces but for a person with a “younger” shape, it works nicely. I see a problem with this vogue for muslin-everything that is sweeping the online sewing world. Of course it’s very, very useful for a seamstress to make a basic fitting block for herself. And custom dressmakers are well-advised to make them for their clients. But it used to be that pattern companies used very consistent sizing (Burda was excellent at this), and as a person who sews for herself you could, only once, take the company’s fitting shell and figure out what adjustments you needed to do to to fit your own body. Then you could confidently apply those same adjustments to every one of their patterns and know that you’d get results that would fit you. I didn’t say that you could be confident of good pattern/fabric matching, or that a specific style would suit you :-). Those you still had to learn by painful experience. But at least you could have the size right, and not have to start from scratch with every project. Unfortunately it seems to me that this one-upmanship in the couture standards (as if every single summer dress needed to be a work of art) has been muddled with working methods of past custom dressmakers, so that innocent beginners now thing it’s normal to muslin every t-shirt. As a result they have encouraged pattern companies to be even more slack in sticking to their defined sizes. So one now often needs to do a muslin when sewing up the big 4, which seem to be morphing from merely strange sizing to really all over the place. Sigh. The truly useful part of a muslin is when you have fabric so precious/expensive that it gives you cold sweats, or that you’re doing some very experimental design (think Miyake or Yamamoto). Then you can see concretely what you’re planning is likely to come to, and make less painful adjustments, or talk yourself out of that wrong path entirely. Most of the time, you should simply make whatever it is out of cheaper fabric the first time (‘wearable muslin’, a misleading term). Interesting comment, fuzzyg! I really don’t think muslin-making is that intimidating, so I would recommend it especially to beginners for number of reasons: to learn fitting, to learn about personal adjustments and fitting, making notes, references, doodling on it, whatever… it’s fun and it’s a personal choice to create a garment that fits. Muslin/toile is a very good mean to achieve that. In addition, one straight skirt muslin = several well-fitting skirts (note, adjustments were made only once – on muslin). I am sure you agree. After all, you also recommend at the end of your comment to make a trial garment in cheaper fabric. What I don’t understand is how does muslin-making influence sizing of commercial patterns? Marina, I don’t think muslins are intimidating, I think they’re a big fat waste of time :-). When overdone, which seems to be becoming the norm. As to sizing in commercial patterns, it used to be very consistent (even if you thought a specific company was wrong-headed, it was always wrong-headed the same way). Now that seems to be going by the wayside, and I worry that telling all sewers that they need to muslin every time is encouraging companies to think consistent sizing isn’t important to us.. Does that make sense? I’m an intermediate beginner, and I just wanted to assuage your fears. I read this article, and having learned some basic techniques from a costume (theatre) shop, I know that there’s a time and a place for toiles (or maybe not! ha ha). The article and all those blogs out there recommending toiles as a tools are just that: another option for people to make their clothes fit better. What’s wrong with that? Mass manufacturers will strive for the cheapest/easiest way until consumers stop buying the stuff. I’m glad to hear a dissenting opinion, but you sound somewhat nihilistic about the future of sewing patterns. What has that to do with toiles and guest bloggers? Fuzzyg, thanks for explaining. In my opinion, if the pattern quality goes down people stop buying them. I don’t see a connection between muslin-making by home sewists and inconsistency in pattern sizing by the big4, but I understand what you want to say. I usually only do this when the pattern is something that needs a perfect fit, or it’s a technique I’ve never used. Or if I don’t quite understand the construction of the garment (I’m a newer pattern follower) I do it to test the technique. I spend a lot of time looking over my pattern pieces, and taking measurements before I do any cutting, and I make adjustments early. My mom always used old sheets, so I do that sometimes too. I have a stash of “testing” materials, so I use whatever I have on hand most of the time. Just follow the link to Amy’s blog – it’s in the post. I thought for years that the only way to get a garment to fit well was to make a muslin, but contrary to the information in this article, I found that a muslin is NOT necessary. The book “Fit for Real People” by Palmer and Pletsch explains how to get a perfectly fitting outfit WITHOUT a muslin. You simply fit the pattern tissue, and fit as you sew. The book has all sorts of wonderful tips on how to alter a pattern so that it fits you just right. I highly recommend it, and you will never have to make a muslin again or deal with an ill-fitting project. The book is not very expensive either, and it’s the only thing that’s worked for me. A few years ago, I picked up a Reader’s Digest home sewing book at an Op Shop (thrift store) for $1. Inside were a very clear set of instructions and black-and-white photos for making a toile, and for adjusting it for all sorts of different body shapes and common fitting problems. I have followed these instructions, strict and stuffy as they are, and have found that my dresses have more often than not turned out beautifully. Some of the suggestions – tucks, snips, re-cuts – seemed drastic, but they all worked! As for making toiles on myself, I tend to spend a lot of time cutting, pinning, guessing, re-pinning and using two mirrors (to see the back! ), but then I transfer the toiles to another, neater piece of calico and reuse them over and over. I also save biggish scraps and oddments to use as toiles, so I have different weights available to trial. It does mean that some of my toiles have been multi-coloured, but the results are in the garments! The making of a toile is such an important process, and fashion sewers need to understand its importance, even if they do not use it often. It helps in giving a better understanding of ones body shape and even help when it comes to choosing the right sewing patterns for your body shape. 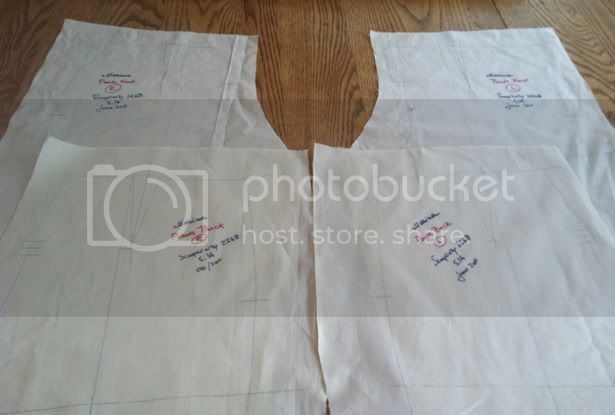 What I like about using a toile is that I can see my exact body shape and sadly (ha) hows its changed over the years. I mainly encompass its use when making more structured garments and trousers. I do have to agree with some of the comments as regards timing and costs or even when to use the process. The answer could be – “tissue fitting”. This can hold some of the answers to fitting problems but it is very limited. I personally try to work with both methods and in doing so, reap the benefits. If a problem can not be solved with a tissue fitting, then it can by making a toile. A better understanding of my body shape. It’s easier to check the portions of a garment you want to make The placement of buttons, pockets and trimmings etc.. Better understanding of how the fabric will drape around the body Source of reference for other sewing projects. I never make a muslin. I tried once by using a dress form made of duck tape, but I suppose the dress form didn’t lead to measurements that were correct enough… now I usually “try on” pieces of garments, for example the bodice to adjust darts and pleats. But I would love to make some muslins though, I’m just too darn impatient. Unfortunately I’m an exceptionally impatient person and can’t bear to make something I won’t use. Apart from my sloper blouse, pant, and skirt pattern to get the right measurements, I don’t make toiles. I only very rarely make a toile: expensive fabric, very important dress and sewing for other people would be the only times I would. I find that you can deal with most fitting issues by a) measuring the pattern carefully; b) cutting enough seam allowance and not the miniscule 5/8” added by the pattern companies, which means you have to mark your sewing lines directly onto the fabric; c) experience! Knowing what adjustments you need to make on certain brand patterns is crucial, so you should really also keep notes on what changes you make. For instance, after having sewn a few dresses for my aunt, I know that Burda patterns fit her best and she then only needs an adjustment in back length. I always need an adjustment for protruding shoulders regardless of which pattern I use. When I did some tailoring and pattern making classes, we were taught that the most important point to make sure that you add enough seam allowance is at the shoulder as everything hangs from here and adjustments of an inch are not uncommon. 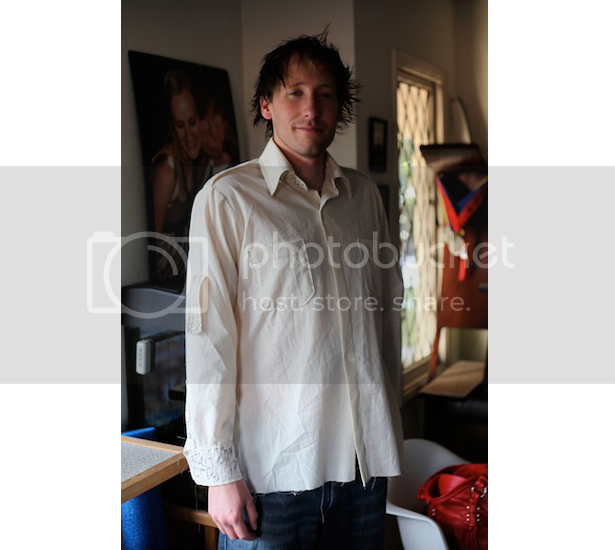 I also agree with previous comments that fitting on yourself is very difficult but digital cameras thankfully helped solve that problem! I haven’t yet tried posting pictures online and asking for help from the community, but next time I am faced with some fitting challenges, I probably will!